Thylacines – Tasmanian Tigers – are to be seen all over the place in Tasmania. We visited the excellent Thylacine Exhibition at the Cradle Mountain Chateau last week; but frankly, you don’t have to trek to such a remote location to see one. You can spot two of them on the State Coat of Arms, not to mention the official logos of Tourism Tasmania and the Launceston City Council, postage stamps and Tasmanian vehicle number plates. The Tiger is the mascot for the Tasmanian cricket team and the symbol for Cascade Beer. Apparently there is a thylacine on the University of Tasmania’s ceremonial mace and on the badge of the submarine HMAS Dechaineux. This is not to mention numerous examples on shopfronts, in video games, cartoons, postcards and children’s books. I now have a little pewter thylacine sitting on Manning Clarks’ 6 volume History of Australia in our bookshelves. Unfortunately, not a single one of these specimens is an actual, living creature. Not anymore. 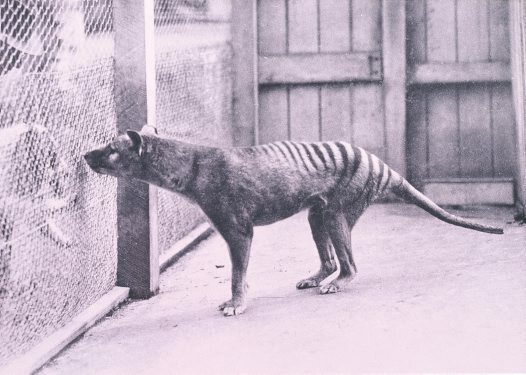 Once upon a time, thylacines roamed over vast areas of Australia and New Guinea; but, despite unconfirmed sightings, and millions of dollars offered in reward for the capture of a live specimen, no-one has found the slightest shred of evidence of a living one since 1933. Apparently, the Tasmanian Emu went the same way, and the Tasmanian Devil is currently on the same slippery slope. 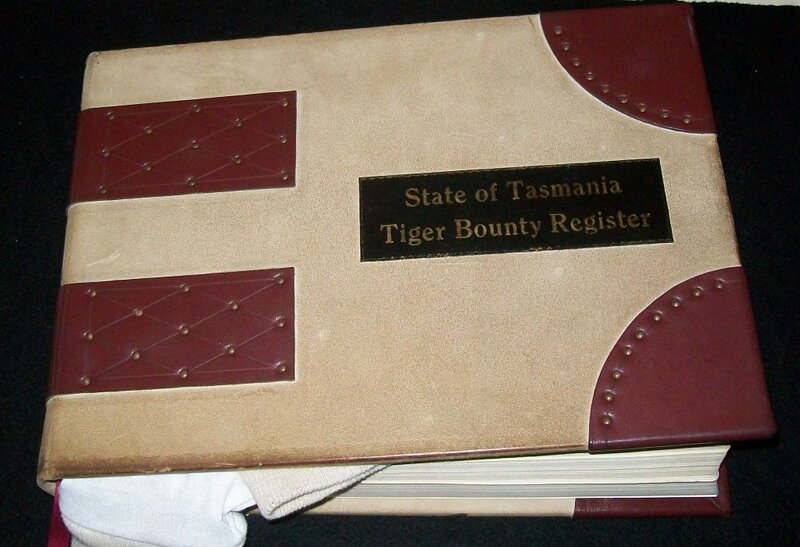 A bounty was offered for dead tigers and this is the actual bounty register, on display at the Exhibition. It contains over 2,100 names and dates. Shooting alone did not drive the unique creature to extinction. There were other factors – all to do with competition with Europeans and their animals. 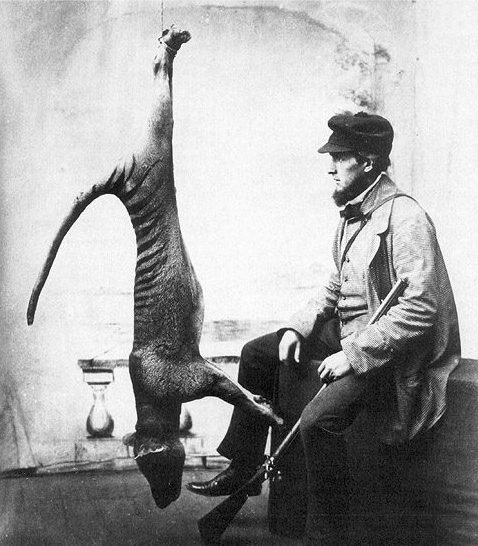 Today, the extermination of the Tassie Tiger is viewed with great regret and sadness, which is, I suppose, something. Perhaps today’s more mature awareness and the resulting conservation efforts, though still widely scorned by Australians, may mean that the thylacine did not die in vain? Why, oh why, though are there reminders and memorials everywhere in honour of thylacines, when there is practically no mention anywhere of the indigenous islanders who were also brought to nothing by European settlement? If there is any evidence of this terrible chapter in history, I couldn’t find it. ~ by Garry on January 30, 2011.